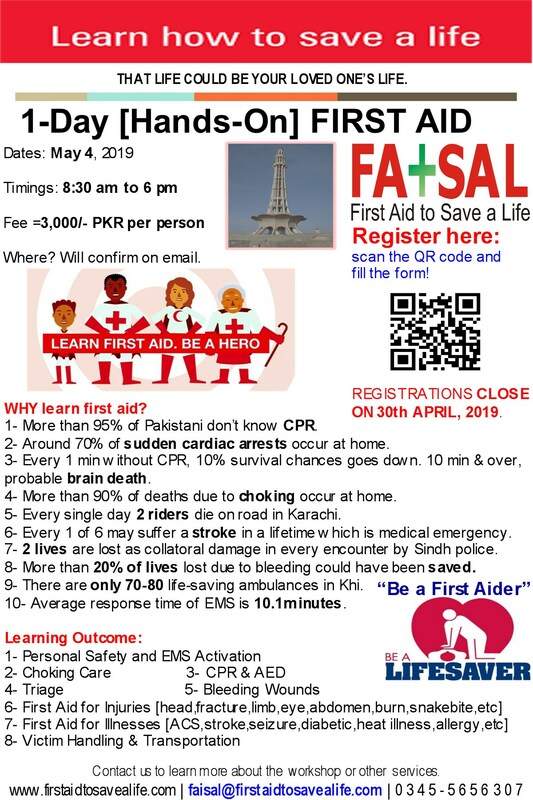 FATSAL is pleased to announce Bleeding Control Workshops in Karachi on December 19, 2018 to raise awareness and train more people in the life-saving skills like how to stop the bleed. The course fee is =2,250/- PKR per person inclusive of certification, training supplies cost, quick wallet card & refreshment. The last date to register and pay workshop fee is December 8, 2018. The late fee of =2,750/- PKR would be payable after this date. This entry was posted in First Aid CPR and AED and tagged ABC of Bleeding Control, ABCs of Bleeding Control, ACS, advance first aid, advanced bleeding control course, Advanced Bleeding Control Techniques, Advanced Bleeding Control Techniques Course in Hyderabad, Advanced Bleeding Control Techniques Course in Islamabad, Advanced Bleeding Control Techniques Course in Karachi, Advanced Bleeding Control Techniques Course in Lahore, Advanced Bleeding Control Techniques Course in Multan, Advanced Bleeding Control Techniques Course in Pakistan, Advanced Bleeding Control Techniques Course in Peshawar, Advanced Bleeding Control Techniques Course in Punjab, Advanced Bleeding Control Techniques Course in Quetta, Advanced Bleeding Control Techniques Course in Rawalpindi, advanced first aid and bleeding control courses, advanced first aid courses in Pakistan, arterial bleeding, Basic tourniquet training class, Basic tourniquet training course, Basic tourniquet training program, Basic tourniquet training session, Basic tourniquet training tool, bleeding control, Bleeding Control Advance Course, bleeding control basic course, bleeding control certification program, bleeding control community training programs, bleeding control community trainings, bleeding control devices, bleeding control gauzes, bleeding control gloves, bleeding control hemostatic dressings, bleeding control items, Bleeding Control Kit, bleeding control organisation, Bleeding Control Organization, Bleeding Control Organization of Pakistan, bleeding control protocol, bleeding control responders, bleeding control stations, bleeding control supplies, bleeding control techniques, bleeding control tourniquets, bleeding control training certification, bleeding control what you need to do, bleeding control what you need to know, blood loss, blood vessels, Body Substance Isolation, bright red bleeding, BSI, can tourniquets be loosen after application, chain of survival, civilians trained to stop bleeding, Clot-forming fibers, commercial pressure bandages, community service and training programs, control of bleeding, control of bleeding and gunshot victim, control of bleeding and gunshot wound, cpr and aed, dark red bleeding, direct pressure, direct pressure to stop the bleed, direct pressure to stop the bleeding, do and dont of tourniquets, do not bleed on road, easy way to stop the bleed, external bleeding course course, first aid, first aid and cpr, gauzes, H compression bandage, heavy bleeding, hemostatic dressings, how Clot-forming fibers stop bleeding, how direct pressure can be used to stop the bleed, how many types of toruniquests are available, how many types of toruniquests are used, how many types of tourniquets are available, how many types of tourniquets are used, how many types of tourniquets in use, how to apply a tourniquet, how to control severe blood loss, how to control severe external bleeding, how to estimate how much of blood is lost, how to pack the wound, how to pack the wound safely, how to save bleeding patient, how to save bleeding victim, how to save wounded patient, how to stop heavy bleeding, how to stuff the would, how to stuff the wound safely, how to use commercial pressure bandages, how to use tourniquets, in company bleeding control kit, Mini compression bandage, national stop the bleed day, no one should die from bleeding, office bleeding control kit, oxygen carrying capacity of blood cells, packed dressings, personal safety gloves, PRIMARY PRINCIPLES OF TRAUMA CARE RESPONSE, professional first responders, public bleeding control kit, quick application of tourniquets, quick clot, safety precautions of tourniquets, save a life, severe bleeding, severe bleeding control course, severe blood loss, Stop Bleeding, stop the bleed, Stop the Bleed Course, stop the bleed day, stop the bleed sava a life, stop the bleed save a life, stop the bleeding, the best technique to stop the bleed, the best way to stop the bleed, The committee on trauma, The new ABCs in business, The new ABCs in Emergency, The new ABCs in Medicine, the use of direct pressure, tourniquets, trauma care response procedure, trauma care response protocol, trauma in an epedemic, trauma professionals, trauma scissors, trauma shear, traumatic injury, traumatic injury causes of death, types of bleeding, types of commercial pressure bandages, types of tourniquets, venous bleeding, what are packed dressings, what is direct pressure, what is hartford consensus, what is indirect pressure, what safety precautions to be exercised, what to use to stop heavy bleeding, when to use commercial pressure bandages, when to use tourniquets, which is more effective to stop the bleed, which type of tourniquets is best, which type of tourniquets is easy to use, why arterial bleeding is difficult to control. Bookmark the permalink.